Bring crisp, clear realistic imagery to your cupcakes with Wilton ColorCups Baking Cups featuring realistic-looking footballs. Imagine the cheers you'll get for bringing football-themed cupcakes to your next tailgate, game-day party or pee-wee post-game pick-me-up. 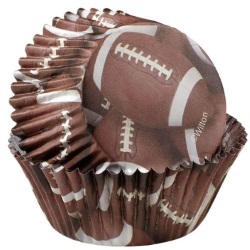 These baking cups are perfect for sports-themed birthday parties or just to make the day of your favorite player or coach. Or, use them for nut cups or treat cups at your next celebration.